Macau is the world's biggest gaming market by a wide margin, generating $37.6 billion in gaming revenue in 2018 compared to just $6.6 billion on the Las Vegas Strip. Gaming is such a big deal in Macau that a single baccarat table can generate $50,000 in revenue for the casino every day. The result for the six concessionaires is a cash flow machine with limited competition. It's the perfect business if you can handle the ups and downs of the gaming market, and on the U.S. stock markets, I see four solid ways to play Macau: Melco Resorts (NASDAQ:MLCO), Las Vegas Sands (NYSE:LVS), Wynn Resorts (NASDAQ:WYNN), and MGM Resorts (NYSE:MGM). Melco Resorts is the one U.S. traded operator that is almost entirely dependent on Macau. Eighty-nine percent of the company's revenue is generated there and that works in the company's favor because the region is so profitable. But it also means earnings are very inconsistent, as Macau's revenue swings up and down. What Melco Resorts has done is tie its dividend payout to the earnings generated by operations, which provides financial flexibility in down times because it isn't obligated to pay a dividend. While competition from newly built resorts has taken a bite out of results in the last few quarters, I think Melco Resorts' highly profitable operations are still worth betting on, especially if the Macau market recovers in the next few years. No company in Macau can come close to the market share Las Vegas Sands has built there. According to management, it had 34% market share in 2018, with the closest rival only managing a 24% share. You can see below that when it comes to balance sheet scale, Las Vegas Sands dwarfs rivals, and with 62% of property EBITDA coming from Macau, it's placed big bets on the region. MLCO Total Assets (Quarterly) data by YCharts. Construction is slowing to a crawl in Macau, and there are only a couple of new casino projects set to open in the next five years. So the six concessionaires are about locked into the assets they own, and Las Vegas Sands' existing resorts and high market share mean it'll dominate the region for many years to come. That's a position any company in gaming has to envy. The high-roller market in Macau is where Wynn Resorts thrives. To illustrate that point, rolling chip volume, which measures the volume of high-roller bets, was $16.2 billion at Wynn Palace compared to $9.4 billion at Las Vegas Sands' Venetian Macau. This is despite the fact that Wynn Palace had 316 tables compared to 652 at Venetian Macau. About two-thirds of Macau's gaming revenue comes from high rollers, so Wynn Resorts is perfectly positioned to profit if the region grows. And if high rollers return after a recent decline, the company will be able to take market share from mass-market focused rivals. MGM Resorts is one of the largest gaming companies in the world by revenue, but it isn't a big player in Macau. The company had just a 7% share of the market in 2018 and doesn't show signs of growing very far beyond that. MGM operates just two resorts in Macau: one in the Cotai region and one on the Macau Peninsula. They generate solid cash flow, which is periodically paid to shareholders in the form of dividends. 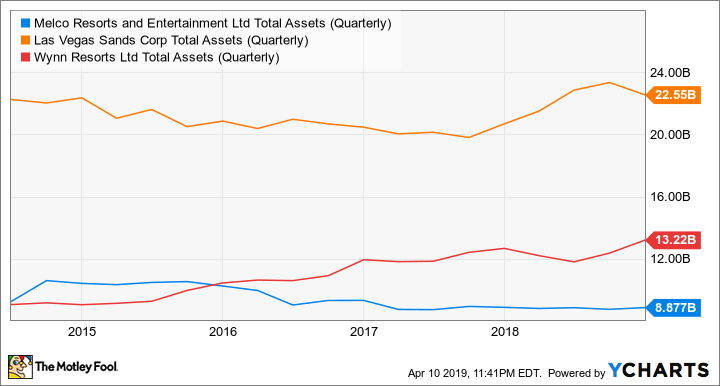 Still, outside of dividend checks here and there, I wouldn't bet on Macau's gaming market by investing in a company that only gets about 22% of its revenue from the world's largest gaming market. Folks looking to invest in Macau have four good options on U.S. markets, and they all provide something different. Wynn is for high rollers, while Las Vegas Sands is the market share giant with a mass-market focus. In between is Melco Resorts, which is the closest thing there is to a pure play in Macau gaming. 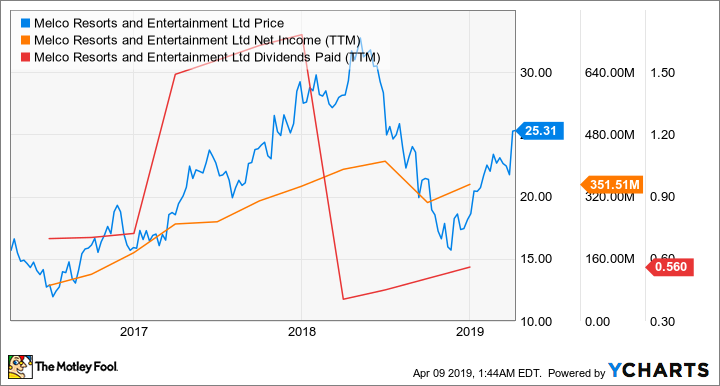 MGM isn't a stock I would consider solely for its Macau exposure, but with its strong diversification across the U.S. and two resorts in Macau, it could be just the gaming stock you've been looking for. There's something for everyone in Macau. Will Macau's Casinos Succumb to China's Weak Economic Forecast?